They tell us that government bailouts were essential to save the viability of private corporations in America. What do you think about this “evidence?” Of the American auto companies, only Ford has reported a quarterly profit since. Ford is the only one that refused government money and is not now majority publicly owned. GM and Chrysler are heavily regulated, are secondarily (after government) union-owned (worker control of the means of production), have had contracted private investors moved to the back of the ownership line, and in the case of GM, there was even a CEO dismissed by the government. 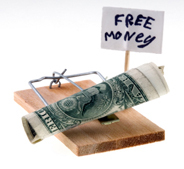 Maybe it would help to look at it this way: Government subsidy is like a mousetrap. Government regulation of the market induces hunger, and government bailout billions is the cheese. In hard times, “Man, that cheese looks good. It sure would provide some immediate relief…Let’s go for it!” “THWACK! Wisdom looks beyond today and immediate appetite. Having worked as a Consultant for Ford Motor Company, I can tell you the moves FMC made well prior to the near collapse of the auto industry set them up for this success we see today. They were visionary! About 5 years ago, Ford began restructuring their business. They are looking like heroes today because they nixed on the Bailout money and should be considered heroes for saving the company. By re-organizing as a practical matter, they averted, unknowingly, the future bailout from the gov't. While Ford was losing billions, they made wholesale changes to their business model and it has saved them. In the meantime, GM & Chrysler were inept and bloated with out of control spending (sounds like the Federal Gov't). I still disagree with the Bush Administrations’ decision to bailout (GM & Chrysler) them out. Like any other industry, they should have gone to Bankruptcy court and cleared the deadwood. I did not see anyone bailing out KMART or Montgomery Wards. Either way, we, as Americans are the losers, the bailouts were a farce and money ill spent. We will more than likely never see the monies repaid from (GM & Chrysler) to the FED. As consumers, we can reward those who have been visionary and offer good products to us. The Bush Admin didn't bail out GM & Chrysler it was the Obama Admin. Do not try to revise history. The Bush Administration did not bail out the auto industry. Obama and the Democrat congress did (and are still doing) as a favor to their union supporters.